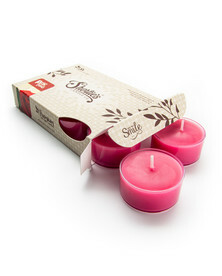 Our Chocolate Fudge Brownie Tealight Candles feature a clear plastic cup and are designed to provide beautiful bright light in all traditional tea light candle holders. 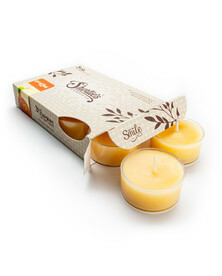 Our Chocolate Fudge Brownie Tea lights are hand poured with our classic food grade natural paraffin wax blend for great scent throw. All of our Bakery tealights are highly scented and designed to burn all the way to the edge and bottom with a good scent throw. The Chocolate Fudge Brownie fragrance oil used in our scented candles and wax melts is Phthalate Free. Enjoy the smell of fresh cocoa powder hand mixed with the aromas of flour, sweet sugar and creamy butter. Add a pan of Grandma's rich chocolate fudge & bake to perfection. 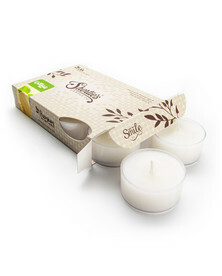 Our Chocolate Fudge Brownie tealight candles feature a beautiful clear container that allows the candle color to shine through brilliantly, and a self trimming natural fiber wick. Our Bakery tea lights will add a luminous splash of color to any home decor, or any event big or small! Each 1/2 Oz. tealight burns for 5+ hours, and pack a great scent throw for such a small package.